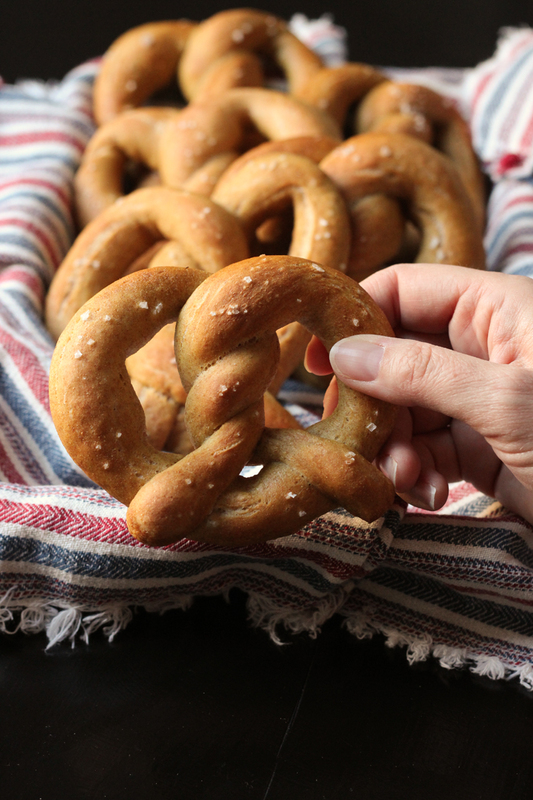 Whole Wheat Soft Pretzels are easy to make and so delicious. You may just want to bake a double batch and hide some away in the freezer for later. It used to be that my kids associated soft pretzels with a trip to the mall. We had some “buy one get one” coupons one summer and so we indulged extravagantly. Alas! Trips to the mall aren’t a regular occurrence for our family. Too expensive. As are the much-loved mall pretzels. Since no one ever really got to eat his fill of mall soft pretzels, learning to make our own was a good move. A game changer, if you will. I did a little study into the history of pretzels, because I’m a food geek like that, and it’s caused me to make these homemade Whole Wheat Soft Pretzels more than once each spring. Believe it or not, pretzels have a much more spiritual history than mere mega malls. In fact, it is said that medieval monks developed pretzels as a way to help children learn their prayers. The pretzel shape is supposed to be reminiscent of praying hands. And, believe it or not, pretzels have their roots in the history of Easter. Since eggs and butter were forbidden foods during Lent — and since many pretzel recipes can be made without eggs and butter, pretzels were a permissible food during that time. Eggs, a food that one would abstain from during Lent, would be hardboiled for longer storage. And eventually it came about that children were served two hard boiled eggs nestled in the hollows of a pretzel on Easter morning. That pretzel eventually evolved into “the Easter Basket.” Pretty cool, eh? Who knew? Personally, I’d rather have a Whole Wheat Soft Pretzel than the basket! Whether you abstain from butter and eggs — now or anytime — soft pretzels are a delicious treat. And making them at home elevates them to a super-duper-outstanding level of deliciousness. They are easy to prepare, but there are a few steps involved. 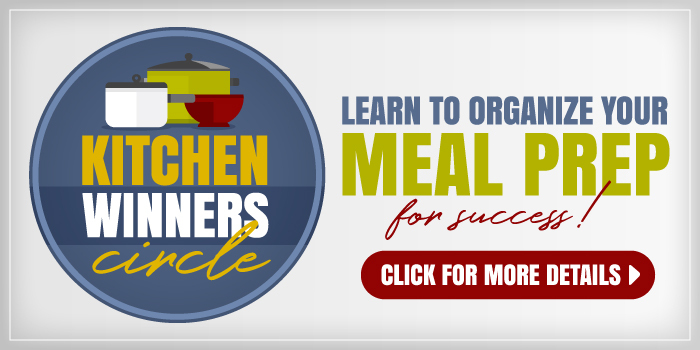 Consider making several batches in a row so that you can eat your fill. Or freeze them for later. 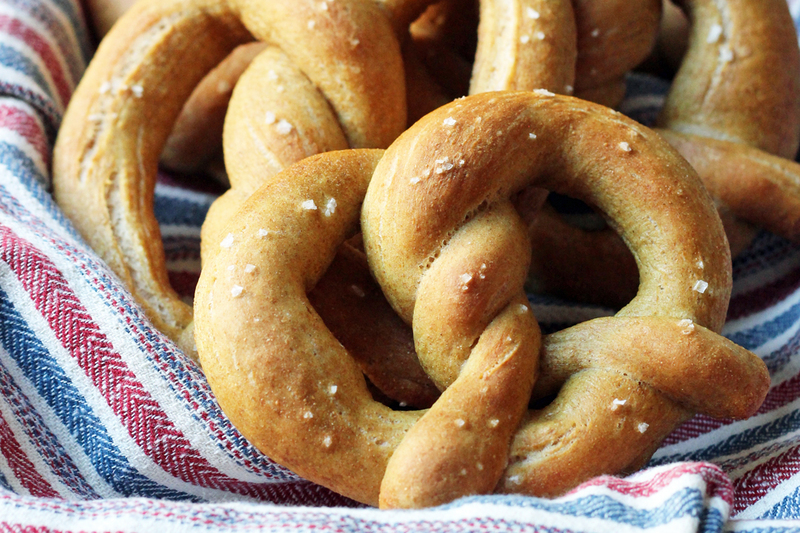 If you like, try my Garlic Herb Pretzel recipe, too. Or check out how to Enjoy Homemade Pretzels in Lots of Fun Ways. Bake it yourself from scratch – Don’t buy mixes. Don’t buy pricey bakery bread. You can make your own better and cheaper at home! Stock up on ingredients when they are on sale. When I find regular kitchen staples on sale, I buy a lot. I’m currently using a price book to track prices and that’s saving me money. For this recipe, keeping an eye on the price of flour can help keep the price down. Buying in bulk – It’s rare that I would buy one bag of flour. I usually stock up when there are good baking sales. I also have gotten into the habit of buying cases of flour from Bob’s Red Mill. 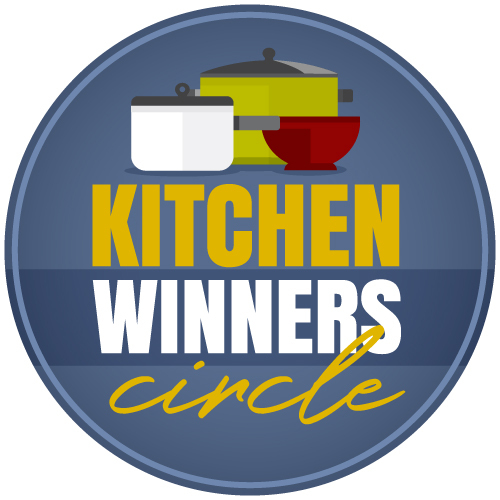 a bread machine or a stand mixer – I love these machines for easier dough making. parchment paper – I don’t love washing dishes, so parchment paper is that small indulgence that makes it easy for me to cook more often. 5-quart pot with lid – I have this one. It’s perfect for cooking chili or a big pot of rice or boiling pretzels. 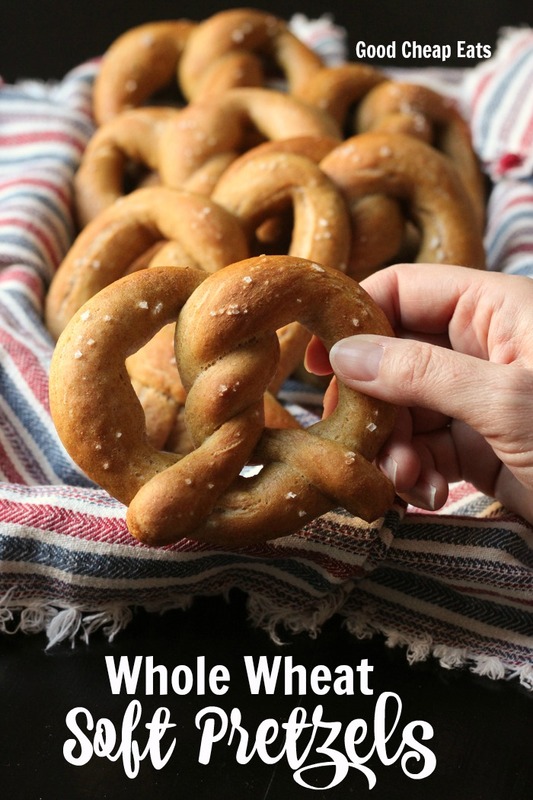 Whole Wheat Soft Pretzels are easy to make and so delicious. This recipe takes a little time, but it’s worth it. In the pan of a bread machine, assemble the 1/2 cup water, milk, sugar, flours, salt, and yeast. Set the machine on dough. When the cycle ends, remove the dough to a lightly oiled surface. If you don’t have a bread machine, this recipe is still delicious! Warm the water and milk slightly and combine it with the sugar and yeast. Let that rest for 5 minutes. Then add the flours and salt. Stir until you have a sticky dough but all the flour is incorporated. Turn it onto a floured surface and knead until the dough becomes elastic. Set into a greased bowl and allow to rise until doubled in bulk, about an hour. Preheat the oven to 450°. Line two large cookie sheets with parchment paper. Divide the dough into 12 equal portions. Roll each portion into a long snake, about 18 inches long. Shape the snake into a horseshoe. Twist the sides of the horseshoe, about halfway up, around each other twice. Flip the ends over onto the U of the horseshoe. Press to seal. Continue until all the pretzels are shaped. Meanwhile, bring the 8 cups water to a boil in a large stockpot. Add the baking soda and continue to boil. Drop the formed pretzels, one at a time into the soda bath. Boil for about 30 seconds and remove to the prepared parchment. Sprinkle with coarse salt, if desired. Once all the pretzels have been “bathed,” bake them for 9 to 10 minutes or until golden. Remove them to a rack to cool. To freeze: Place the cooled pretzels (unbuttered) in a ziptop freezer bag and store in the freezer for up to 3 months. Thaw, wrapped, on the countertop at room temperature. You can reheat them in a warm oven for five minutes to freshen them. Thank you for posting this recipe!!!! I’ve tried a few (flops!) pretzel recipes. My kids LOVE them and I can’t wait to try this one. Thank you for sharing this story. At Easter here (Portugal) and in Germany, we see breads (and maybe pretzels–can’t remember) with hard boiled eggs sticking out. Helps us understand why now. Looks like a great recipe too! Wow! You never cease to amaze me with your ability to find ways to prepare food that is not only delicious, but also healthy(ier). Best of all, it looks soo yummy! I’ve got to get a breadmaker so I can make these. Then again, I might be stuck in the kitchen day in and day out! @Shannon L, you’re sweet. You can make them without a bread machine, just follow standard procedure for traditional bread. Warm the milk and water, add the other ingredients, knead, and rise. I’m just too lazy to learn how to do that well. Yes, let the dough rise until doubled in bulk, about 1 hour. These look fabulous! and I didn’t know that little tidbit of the Easter basket. I had boiled eggs for breakfast since I’m cutting carbs this week, and then you go post these yummy pretzels that my kids would love!! Torture 😉 But I’m definitely bookmarking it for the very near future! We use bread and all-purpose flours. Could I change up the recipe to only use the bread flour?? I never knew the pretzel background story 🙂 How cool! We make soft pretzels here too… usually smothered in cinnamon sugar, because you’re right, Jessica, the whole wheat makes them taste healthy, and we usually end up using all whole wheat (the freshly ground stuff we use doesn’t make them as dense as store bought whole wheat would, so we can get by with it). Thanks for the new recipe. Where do you get freshly ground whole wheat, and how expensive is it? I don’t get freshly ground, just bought a huge bag from the co-op. Many folks have their own mills, though, and grind wheat at home. @Emily, Exactly. I think some stores like Hyvee offer to grind wheat fresh for you in their natural foods department. I have a wheat grinder and I buy 50 pounds of wheat “kernels” at a time for $24. I think it takes our baked goods over the top compared to how they used to taste when I tried using all whole wheat store-bought flour. What kind of wheat grinder do you have? I have been dreaming of grinding my own wheat! Thanks! @Kimberly, I have a Wonder Mill, which I *love*. It can grind multiple types of grain, including corn for fresh corn meal. It’s a big investment, but my husband actually had our family all pitch in for my birthday one year, so that made it extremely affordable ;-). You have an incredible way about you that makes almost anything seem easy to make at home. I have seen pretzel recipes before and I was very intimidated to attempt it. This seems doable and very fun! My children will LOVE the roll into snakes part. Thanks! And thanks for history behind them..will share while making!! I printed them out right away, they look awesome. We actually just bought some frozen ones at Costco but as soon as those are gone, I’m making these, thanks! 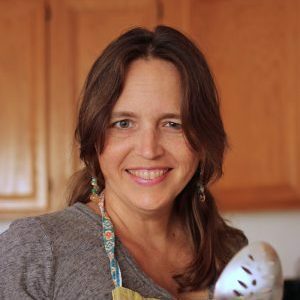 I love your blog and appreciate how well-rounded your Life As Mom blog is, as well. However, I wanted to point out that you can’t really call something whole wheat if the whole wheat flour only makes up 1/4th of the flour in the recipe. I think, but am not sure, that it is okay as long as it makes up more than 50% of the flour in the recipe. Nevertheless, these sound yummy and I may have to make them soon! Well, I am guessing you’re probably right, especially if I was selling the product. But, since they taste so wheaty already, I don’t think I would add more. But, I will remember that o the next one. Oooooo, these look so good! Thanks for sharing this. I can’t wait to try them. I made these last night. I used a mixer instead of a bread maker. I also used all Hard Whie Wheat freshly ground. These are SO GOOD! They taste better then what you get at the mall!! The only thing I changed was the temp! I moved it down to 390 for the second batch because the first batch got a little brown on the bottom. I didn’t have the paper to put down so that might have not helped. I’ll try it that way this weekend! @Amy, Are you saying you used 100% hard white wheat and no bread flour? I was wondering about doing that myself as I read through the recipe. Did you change any other ingredients? JL – Yes! I used 100 % Freshly ground Hard White Wheat. I did not use any bread flour or make any other changes to her Recipe. I also used the parchment paper when I made them this past weekend and had no issue with them getting too brown. They are so very good and with the Hard White Wheat they taste even better than the ones at the mall!! Do you think you can you sub AP for most of the bread flour and sub in a little more whole wheat flour to up the protien content (thus replacing the need for bread flour)? Or do you think that would make them too tough? @Jessica, Gave it a try- they came out delicious! I remember hearing a TV chef remark that you can sub AP for bread flour if you mix in a little whole wheat flour to up the protien content… Guess it’s true! I would add a little bit of baking powder and salt (sort of like adding self rising flour). 1 cup AP, 1 tsp baking powder, 1/4 tsp salt =1 cup self rising flour. I’m going to try and make these like this soon, as I like to use more whole wheat flour. We made these yesterday and my 6 year-old rolled and shaped them all himself. They were fantastic! Thanks so much for this great recipe and the history!!! I buy fast rising yeast and soy lecithin from Fast Easy Bread. I can make dough in 15 mins and then skip to the shaping and boiling. Can’t wait to try it. Thank you for the idea and history. I’m salivating! Recipe is printing and I can’t wait! Thanks! 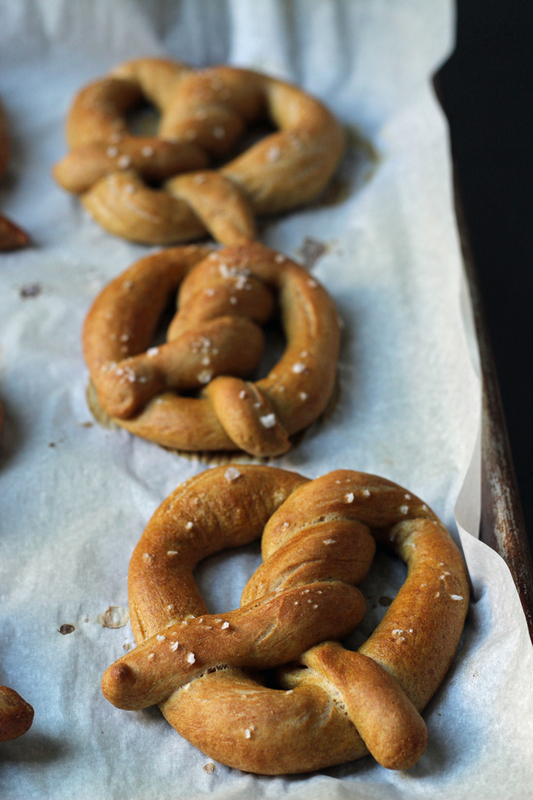 ok, you just don’t know….I’ve been searching for a pretzel recipe since December. My mother used to make them, but since she is no longer with us, I don’t have her recipe. I wanted a recipe where I could use my bread machine to make the dough process easier. I never found that recipe. Till now. Thank you! I can’t wait to try these! I went to buy the ingredients over the weekend for these. I don’t have any “specialty” stores in my area, just a Wal-Mart and Meijer….I couldn’t find anything labeled bread flour. What am I missing? I buy huge bags of bread flour at Walmart, so I’m confused that you couldn’t find it. It’s right next to the regular flour, usu a yellow bag. Ok, I have a stupid question (and I bake quite a bit, just never made pretzels before…). When you say roll it out to about 18″, do you roll out with a rolling pin or like you’re working with Play-Doh? They didn’t seem to stretch easily using the Play-Doh method but the rolling pin seemed to flatten them too much. Was I just not being agressive enough on the Play-Doh method??? Thanks – they’re in the oven now, can’t wait! @Amy, I rolled them between my palms, pressing fairly firmly. Hope that helps! These are terrific! Thanks for the recipe! The water bath is a traditional part of making pretzels. They just won’t have the right texture if you baked them without the bath. Glad it worked out for you in the end! What is the best way to store these if not using them right away. And how to reheat. Once baked and cooled, I’d put them in a ziptop freezer bag in the freezer. When ready to eat, thaw in the package at room temperature. You could reheat in a 350 oven until warm. I would like to try this using some King Arthur white whole wheat flour. I would also like to sub no more than1/4 of the flour requirements with some spent grain flour. Any thoughts? I have access to spent grain from the local brewery in town. I dehydrated the mash, then put it into a blender and got it to a fairly fine texture. It still has an occasional barley hull, but hoping to put it through a fine sieve before using it. Some people say to proof the dough overnight in the fridge. They say the slow fermentation of the dough helps to enhance the flavor. I’m sorry I don’t think I can help you. I haven’t ever used the products you’re talking about.